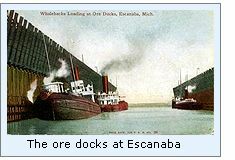 Departing Escanaba, and heading for the open waters of Lake Michigan, vessels were forced to thread their way through a chain of islands which spread themselves across the entrance to Green Bay between the Door and Garden peninsulas. Traffic bound for the southern ports of Lake Michigan took the Rock Island Passage which passed between Pottawatomie Light and St. Martin Island, while traffic setting off to coast the north shore into the Straits took the more northerly Poverty Island Passage, between Poverty and Gull Islands. Shoals surrounding the Gull Islands forced vessels to hold close to the south shore of Poverty Island, where depths averaged over 70 feet and provided safe passage for vessels of all sizes. However, with no light to guide vessels through the passage, vessels unfortunate enough to be ready to enter Poverty Island passage under the cover of darkness were forced to wait until daylight before beginning their way through. In an attempt to remedy the situation, in its annual report for 1867 the Lighthouse Board requested an appropriation of $18,000 for the construction of a light station on the southern tip of Poverty Island. When no response was received the following fiscal year, the Board reiterated the request in its next four annual reports. However, it was not until a number of memorials from Michigan and New York maritime interests were presented to Congress early in 1872 that the matter appears to have been given serious consideration, being referred to the Department of Commerce for an investigation of feasibility. Congress finally appropriated the necessary funds on March 3, 1873, and a crew resumed work at Poverty Island on August 28 of that same year. Designed as a virtual duplicate of the station built at Sturgeon Point three years previous, construction was progressing well when on October 25, a fire in the temporary barracks built for the construction crew grew quickly out of hand, destroying both the barracks and much of the construction materials stored on-site. With it being so late in the season, and without the funds to replace the lost supplies, work on the island ended for the season, and the crew was removed. Work resumed in May of 1874 with the delivery of a small working party, and progressed though the summer until all available funds were depleted. With the keeper's dwelling completed and the tower completed to a height of 31 feet, a temporary light was installed on the roof of the dwelling on August 1, and the crew removed once again until the funds required to complete the project became available. Congress appropriated the additional $3,000 on March 3, 1875 and work on the Poverty Island station resumed soon thereafter. By the beginning of August, work on the station was virtually complete, with both the keeper's dwelling, tower and connecting walkway constructed of red brick, with the tower standing seventy feet from the top of the dressed-stone foundation to the ventilator ball atop the decagonal cast iron lantern. The district Lampist installed the flashing red Fourth Order Fresnel lens atop its cast iron pedestal at a point 65 feet above the base of the tower. The tower's location some thirteen feet above the level of the lake, provided the lens with a focal plane of seventy-eight feet, and a visibility range of sixteen miles at sea in all directions. The new light was exhibited from the tower for the first time on the evening of August 10, 1875, and with the removal of the temporary light on the keepers dwelling, the work party departed the island after three years on the island. After ten years of relative peace and quiet on the island, the keeper's knew their lives were to be inexorably changed when the Lighthouse tender WARRINGTON delivered a work party and supplies for the construction of a fog-signal station on the island during the summer of 1885. Work on the structure and its duplicate boilers and 10-inch steam whistles was finished at the end of September, with the fog signal officially placed in operation on October 1. September 1894 saw the construction of a circular iron oil house at the station, and an L-shaped boat landing. That winter was also memorable, as the station's keepers toiled to load 6 tons of coal and 48 cords of wood into the fog signal's hungry boilers in order to keep the whistles wailing for a total of 489 hours, the most hours of operation in any single year in the station's history. The light in the station's lantern was automated in 1957, and with the installation of a 300 mm acrylic optic atop a skeletal steel tower in 1976, the cast iron lantern was removed from the tower, and the tower sealed-off. The lantern was unceremoniously lowered to the ground, and left to lay with the station's abandonment. 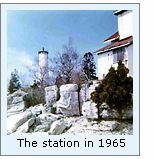 During the 1980's, representatives of Delta County Historical Society became aware of the old lantern's existence, and obtained permission from the Coast Guard to transport it back to Escanaba for installation atop the newly reconstructed Sand Point Light station tower, where it sits to this day. 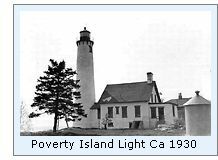 Click Here to see a complete listing of all Poverty Island Light keepers compiled by Phyllis L. Tag of Great Lakes Lighthouse Research. We understand that Shoreline Resort at Gills Rock is now offering charter trips around St. Martin and Poverty Islands aboard their converted Navy P.B.R. Contact then directly for additional information on these charters. Great Lakes Light Lists for 1876, 1924 & 1953. Annual reports of the Lighthouse Board, 1864 through 1909. Great Lakes Coast Pilot, 30th Edition, NOAA. Research preparing for creation of Sand Point page, September 2000. 2001 Photographs courtesy of Larry Bell.